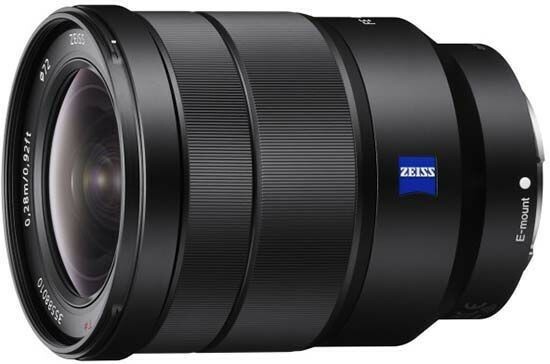 Listed below are some of the rivals of the Sony Vario-Tessar T* FE 16-35 mm F4 ZA OSS. The Canon EF 16-35mm f/4L IS USM is a new professional wide-angle zoom lens. Boasting built-in image stabilisation with fast and quite auto-focusing, the EF 16-35mm f/4L IS USM is a more affordable alternative to the faster EF 16-35mm f/2.8L II USM optic. Read our in-depth Canon EF 16-35mm f/4L IS USM review complete with full-size sample images. The Nikon AF-S Nikkor 16-35mm f/4G ED VR is a professional ultra-wide angle lens. Aimed mainly at full-frame DSLR users, but also compatible with DX bodies where it provides a focal range of 24-50mm, the Nikon 16-35mm f/4 also features built-in optical image stabilization. Read our in-depth Nikon AF-S Nikkor 16-35mm f/4G ED VR Review complete with full-size sample images. The Olympus M.ZUIKO Digital ED 9-18mm f/4-5.6 is a tiny wide-angle lens for Micro Four Thirds compact system cameras. Offering an 18-36mm focal length in 35mm terms and a weight of just 155g, the Olympus 9-18mm lens is much smaller and lighter that other ultra wide-angle lenses. Read our Olympus M.ZUIKO Digital ED 9-18mm f/4-5.6 review to find out if it deserves a place in your lens collection. The Panasonic LUMIX G VARIO 7-14mm F4.0 ASPH is a new super wide-angle lens for the Micro Four Thirds system of interchangeable lens cameras. Offering an effective focal range of 14-28mm in 35mm terms, the Panasonic 7-14mm lens offers the widest focal length of any Micro Four Thirds lens. Read our Panasonic LUMIX G VARIO 7-14mm F4.0 ASPH review to find out if it's worth adding to your lens collection. The Tokina AT-X 16-28mm F2.8 Pro FX is an affordable wide-angle lens for full-format DSLR users. Incredibly well-built, the Tokina 16-28mm is a good match for cameras like the Canon EOS 5D MK II that we tested it with. Read our Tokina AT-X 16-28mm F2.8 Pro FX Review to find out if it's worth considering instead of the Canon and Nikon alternatives.